All right, this is going to be a controversial one. 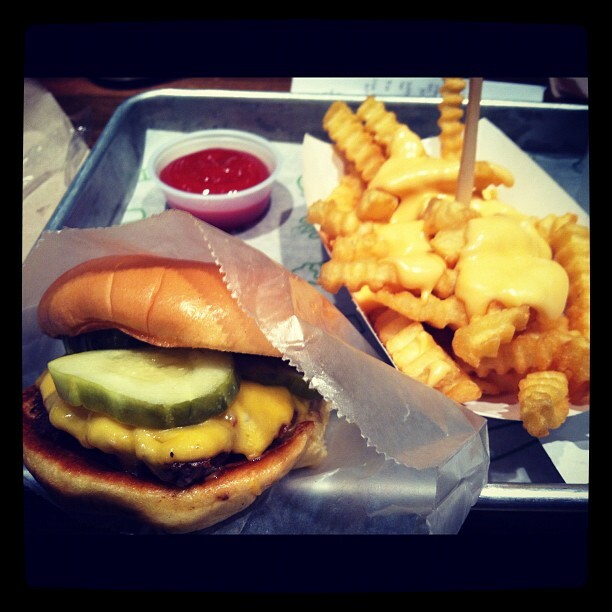 Shake Shack is a New York burger institution. The lines for this place wrap around the block at any given hour at any of their multiple locations. People liken it to In-N-Out burger for Californians. It has been reviewed countless times as the “best” of all the burgers in the city. I went on Sunday to the Upper East Side location and found it…overrated. And I’m not just trying to be a contrary hipster. I was really excited to try this place. Don’t get me wrong, it was a pretty good burger. Just nothing special enough to wait in line for hours. I was lucky that when we went, we only had to fight for a table for a few min. while we waited for our food. They do use fancy fresh ingredients, but its still just a cheeseburger with mustard, ketchup, and pickles. But maybe a burger can never really be spectacular. It is usually awesome and just what you are craving, but waiting in line outside in the cold for one…? The cheese-fries, however, were spectacular to me. Usually I find thick, crinkle cut fries kind of gross, they are just warm hunks of starch. These were the perfect size and consistency, crispy and fresh. And they had real cheese. It was a bit unnerving to see cheese topping that was not day-glo orange, but it was enough cheese to be delicious without being overwhelming. So, I would recommend Shake Shack. It is worth a try, especially during off house. But I can’t say that I would recommend spending hours trying to get on of their burgers. Here’s an experiment for the interns, service workers, graduate students, freelancers, and temps: Think deeply about your privilege, your advantages, your family history, that some may have it better or worse off than you do. Then, forget all of it… Resist the urge to feel sad or pass blame, and we’ll all share our favorite “I’m so poor” jokes at the end. -from GOOD; “Hustlin’: The Rise of the Privileged Poor”.